F. Scott Moody, the cofounder of Apple-acquired company AuthenTec, gave a presentation this week on the origins of what is now the Touch ID technology found in the iPhone 5s, and AppleInsider was present for a hands-on with an early prototype fingerprint scanner. Moody spoke Tuesday night to students at North Carolina State University's Department of Industrial and Systems Engineering. There, he recalled anecdotes about developing the technology that would eventually become Apple's Touch ID, and what made AuthenTec an appealing acquisition. 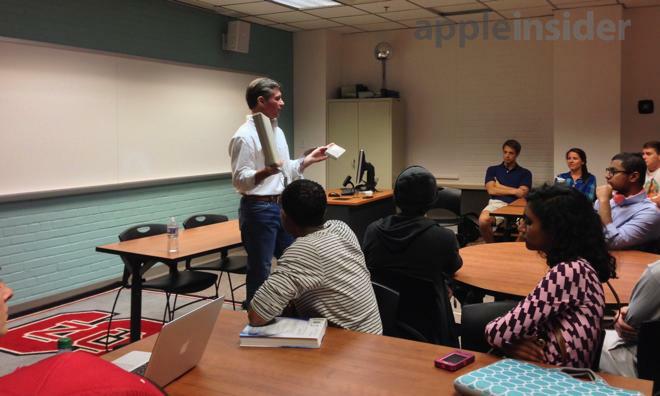 He explained to the students that it's AuthenTec's technology behind an 8-millimeter by 8-millimeter sensor found beneath the iPhone 5s home button. 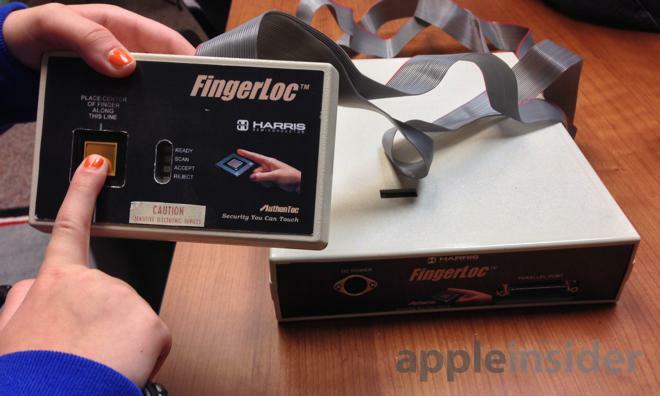 Early versions of Touch ID were dubbed FingerLoc, with a fingerprint scanning box connected via ribbon to another, even larger box. "We're looking at pores, structures of ridges and valleys, and instantaneously tell who you are," Moody said. "Every time you use it, it learns more about you. Because it knows, 'This is Alex,' every time you use it gets easier and easier." The first version of AuthenTec's fingerprint sensor wasn't quite as elegant as the tiny scanner found underneath the iPhone 5s home button. Moody brought with him the FingerLoc, an early predecessor to Touch ID, which came in a large box much bigger than an iPhone. 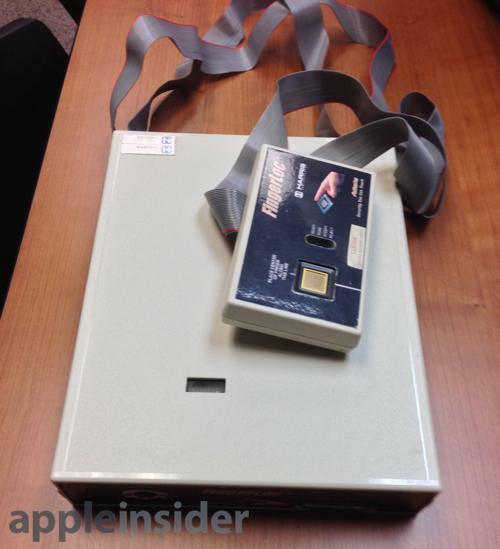 And that box was connected via a ribbon cable to an even larger device that powered it. After creating the bulky FingerLoc prototype, Moody visited with venture capitalists to explain his vision: Shrink the technology down, and make it embeddable in smaller devices. Early demos, however, featured a hole in a table with the FingerLoc box underneath, hooked up to what Moody called "the biggest PC we could find." Things didn't always go as planned, either. Moody recalled one demo where he was presenting to the chief technology officer of IBM, back before the company had sold its PC division to Lenovo. IBM was an early proponent of mobile fingerprint scanners, prominently featuring them in its business-oriented ThinkPad line of notebooks. Unfortunately, that demo went poorly: IBM's CTO tested the technology, and was incorrectly identified as AuthenTec cofounder Dale Setlak. AuthenTec's early demos didn't always go as planned, but once the company perfected its technology, Apple showed intense interest. "I joked that all CTO fingerprints look the same," Moody said. "He didn't buy it." Though the early versions were both buggy and bulky, what drove FingerLoc was essentially "a piece of silicon" that was improved over time, he said. "We convinced people that the signal processing and work could be shrunk into an exceedingly small sensor that we eventually got down to 80 cents," he said. The metal ring around early prototype scanners, just like the one in the iPhone 5s home button, works like a capacitor, sending a signal through the user's finger that allows it to sense through the outer layer of dead skin, into an inner layer where the skin is alive. Moody said AuthenTec worked closely with a number of dermatologists in development to perfect the technology. "With other sensors, your ridges would collapse into the valleys. Ours doesn't," he said. Once the early technology and size issues were resolved, the AuthenTec team worked to make the sensor even more embeddable and sleek. Along the way, he said, there was a lot of trial and error and failed experiments, but he and his team learned from each of them as they refined their technology. When AuthenTec came out with their final product, the company generated interest from a number of customers, including Apple, Motorola and Fujitsu. Apple, in particular, "ate it up," Moody said, and eventually bought the entire company in 2012 for $356 million. "We had a great team of engineers —which I think is highlighted by the fact that Apple kept the engineering team," he said. For Moody, the goal in AuthenTec's product was to make users' lives easier. The development of the company's fingerprint scanner was aimed at enhancing privacy and aiding in convenience in a way that would be accessible to all users. "I didn't care about government standards for fingerprint sensors, I cared about low cost and identifying you in a cheap and accurate way," he said. "I'm not hooked to the tech, but what I'm hooked into is what the tech can do for you, the user."